Big news in the world of weddings: designer du jour Sophia Webster is extending her quirky-cool aesthetic to bridal shoes, launching today on her own website and on Net-A-Porter.com. She’s reworked seven of her signature styles with a clever bridal twist – cue iced-up courts, ivory marabou pom-poms and brilliant Wifey For Lifey speech bubbles. And the designer’s even thought about flats. We love the speech bubble jelly sandals, ideal to slip on as the dancing kicks off. ‘When I first decided to do bridal shoes I was not yet married so thinking about what I would wear for my wedding was a great starting point,’ the designer said this morning of her new mini-line. From Happy Ever After clutch bags, to slogan soles, Sophia’s capsule collection is bound to appeal to any bride looking for a special way to bring her personal style to her big day. You could treat them as a subtle touch underneath a traditional dress or as part of an entire statement outfit but, however you style them, a pair of these will definitely be both a major talking point and an Insta-worthy photo op like no other. 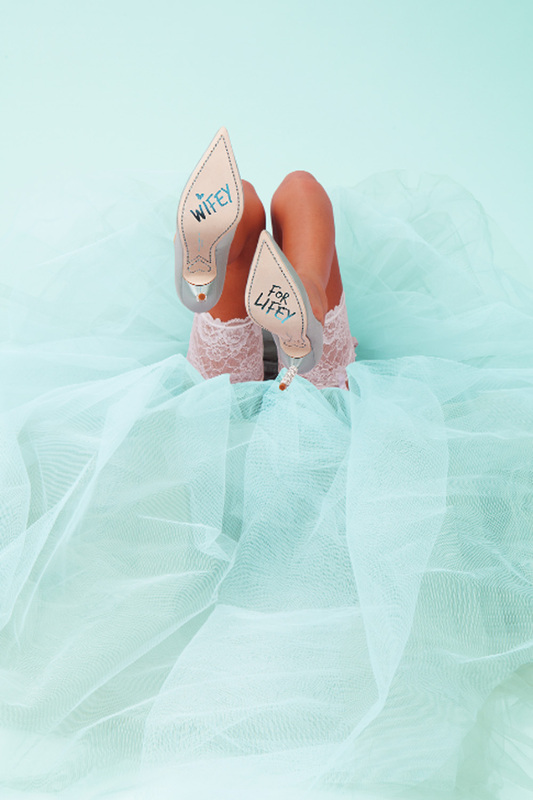 Sophia Webster bridal shoes are available now from sophiawebster.com and Net-a-porter.com.